Check Out My Video On The Gooru! My video explaining how a user can anonymously upload a file to Google Drive has been posted on The Gooru. 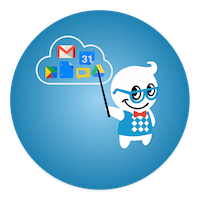 The Gooru is an awesome resource that offers many tips and tricks related to Google Apps for Education (GAFE), and I highly recommend subscribing to the Gooru Daily Newsletter. The dropbox video I posted uses a Google script that was created by ITRT Michael Price. The script has since been updated by Willem Karssenberg to include an automated email notification alerting you whenever someone drops a file into the Google Drive Folder. If you are looking for quick and easy way to have students submit a digital assignment, you might want to consider setting up your very own Google dropbox.